Metal-detecting between 2002 and 2009 recovered a number of objects from the Roman to post-medieval period, including a medieval to early post-medieval cauldron, possible strainer, lead ceiling or wall decoration, crucible fragment and hooked strap fitting, as well as a possible Late Saxon bridle bit and stirrup. Further metal-detecting in 2011 recovered medieval and post-medieval coins as well as medieval, medieval/post-medieval and post-medieval metal objects including medieval dress accessories, a medieval/post-medieval globular lead weight and post-medieval book clasp and crotal bell. Medieval buckle, probable strap end and pot mend with sherd attached. Medieval to early post-medieval cauldron, possible strainer and hooked strap fitting. 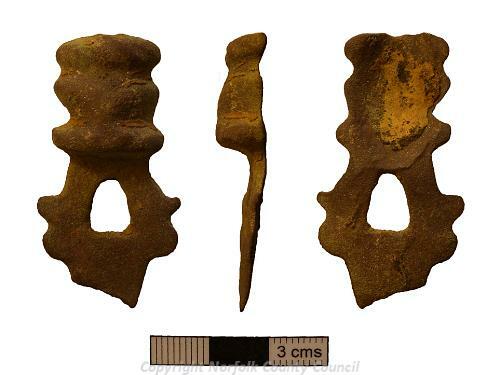 Medieval to early post-medieval weights. 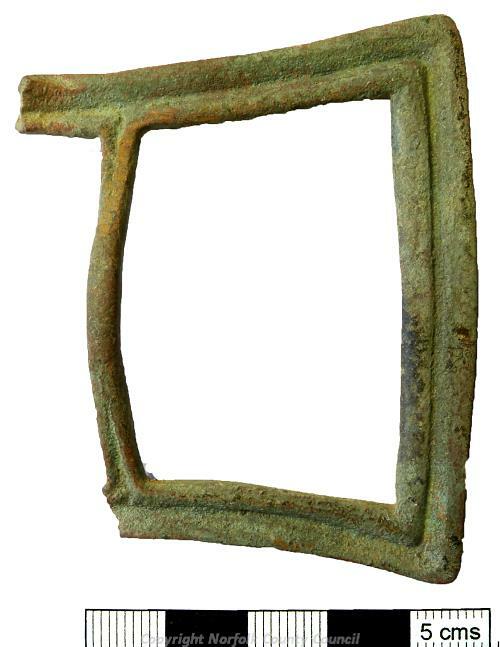 Post-medieval buckle, weight and harness mount. A. Rogerson (NLA), 23 July 2002. Late Saxon, medieval and post-medieval metal objects. Before 23 June 2004. Metal-detecting. One Roman and five medieval coins. ?Roman, Late Saxon, medieval, post-medieval and undatable metal objects. Before 7 February 2007. Metal-detecting. One Roman and four post-medieval coins, a Bronze Age rapier or knife fragment (S1), a Late Saxon strap end and medieval/post-medieval artefacts. Before 14 May 2008. Metal-detecting. One post-medieval coin and post-medieval metal objects. A. Rogerson (NLA), 28 July 2009. Before 29 July 2009. Metal-detecting. Possibly Roman, medieval and post-medieval objects including a fragment of crucible, and medieval and post-medieval coins. E. Darch (HES), 28 September 2010. One medieval and one post-medieval coin, medieval, medieval/post-medieval and post-medieval metal objects. October 2014. Metal-detecting. Elden Tours, Field HF. Site extended to whole field. .
SET102014 - PAS details to follow. A. Beckham (HES), 21 January 2014. <S1> Illustration: Gibbons, J.. 2007. Drawing of a Bronze Age reworked rapier or tanged knife fragment.. Film. 1:1.